Roof wash Sacramento – Call For Your Estimate Today! Monsters Roof Wash has been cleaning all types of roofs all over Sacramento for several years now. Our well-trained staff will provide a quality roof wash Sacramento. They have the experience and know how to get the job done safely and efficiently. We strive to make every one of our clients has satisfied as possible. We have been providing services for roof cleaning and roof wash Sacramento for many years so we have hundreds of satisfied clients. We have chemically washed and cleaned just about every type of roof there is. 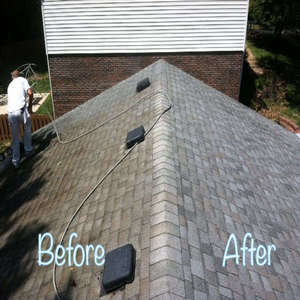 Roof cleaning usually only needs to be performed about once every ten years to extend the life of your roof. Since you only have to have it done once in a while, why not choose a professional to come out and take care of the project for you. That way you know for sure that your roof wash Sacramento is done safely and correctly. Having your roof washed in Sacramento can be very dangerous as you need to climb on to the roof to wash it. Most falls from even 6 ft can cause serious injury. Falling from a 2 story roof significantly increases your odds of parallelization or even death. Employee safety is our key concern. To prevent injury we use only the safest methods possible. Serious injury can incur when working on a roof which is why here at Monsters Roof Wash, we only higher technicians that take safety as seriously as we do. Our safety motto is that no task is worth injury. It is constantly stressed to our staff that many people who do not use the proper safety equipment become seriously injured if not worse. Our roof wash Sacramento includes rinsing down the roof & applying our Eco-friendly chemical wash solution. 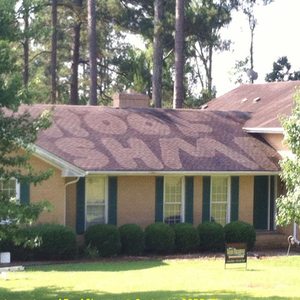 Why wash your roof? Algae, moss, or lichen feed on limestone in the roof shingles and continue to multiply creating a roof full of unsightly streaks. The algae dislodge the protective granules and when left untreated, these algae can prematurely degrade and cause roof failure. Additionally, it can expose residents to other potential health concerns. That’s where you turn to Sacramento Monsters Roof Wash. With our proven chem wash method, we do not use traditional power washing. Instead, we use a safe and effective solution than kills algae, moss, and other bacteria instantly. We will gently spray your roof removing years of growth bringing your home back to its original look. In addition to that, our in-house Eco-friendly chem wash solutions are water activated which will provide your roof with years of protection against algae, moss and other bacteria. Our chemical roof washing service works on all types of roofs from composite to tile roofs. Providing a complete cleaning solution that continues to take effect with every rain. The application can be applied every year to prevent the issues from re-occurring. Our roof wash system has proved time after time how effective the chemical process is for removing debris from the roof. Sacramento Roof Washing has become a specialty our clients call us to complete year after year. We find more and more clients looking for roof washing services every year. Chemical removal of algae, moss and other growths on the roof. Sacramento roof washing companies attempt to pressure wash the roof which often causes damage to the roof. We refrain from washing the roof in a way which may cause damage. Our goal is to protect your home and bring back the beautiful look you deserve. 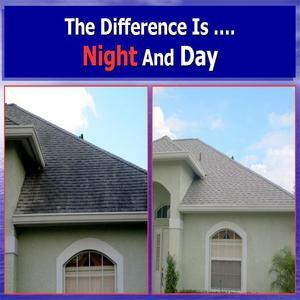 Don't allow your roof to deteriorate & maintain your home value wash your roof. Using a chemical treatment we will wash down the roof which continues to activate over the course of the year. Washing your roof is an effective way to clean hard services such as tile roofs. We would use a pressure washer for such scenarios. Having a roof wash Sacramento done at your home or business is just like having any other contractor work on your property. It is your responsibility to make sure that you are highering a licensed contractor who is bonded and insured. Remember if a contractor is not interested in doing thing the proper way to become a legal contractor, chances are he is not going to provide quality work. Call today for an estimate on a roof wash Sacramento. We promise you that from your very first experience with us you will be happy that you did. Why Monsters Gutter for your Roof Wash? We here at Sacramento Monsters Roof Wash, take pride in the quality of work that we provide. Our Roof Wash services take the worry and stress off your hands and will leave you with s clean and protected roof that will last for years to come. Many of our clients find themselves with a huge bill dealing with entire roof replacements due to not regularly maintaining and performing proper Roof Wash services. Our customers realize this danger and expense and call Sacramento's best Roof Wash service... Sacramento Monsters Roof Wash (916) 333-0329 You Should call us today. When it comes to getting a Roof Washing, Sacramento California residents find the most important aspect to be the service provider. When washing a roof we work hard to apply the treatment to every area in order to provide the best coverage & protection. When the rain comes your roof will be in for a treat as the chemical reactivates and continues working through the year. Washing roofs have become a big part maintaining your home's appeal. Our clients are requesting roof washes year after year. Having us re-apply our formula to the roof in order to achieve the best appearance on their roof. Sacramento is often very temperamental weather with 100+ degree summers & near zing in the winter time. So maintaining your roof in Sacramento is extremely important. Roof Washing in Sacramento is crucial.